Contingency present at the ground breaking for the Prince Hall monument in Cambridge, MA. The fraternity of Free and Accepted Masons has members from every ethnic group and every continent in the world. Brotherhood is a primary teaching of Masonry–that each person must be judged as an individual, on his own merits, and that such factors as race, national origin, religious creed, social status, or wealth are incidental to the person’s character. Freemasonry was brought to North America in the 1700s, a time when racial attitudes were very different from today. As happened with many churches and social organizations, these attitudes caused Freemasonry for African-American men to develop independently. 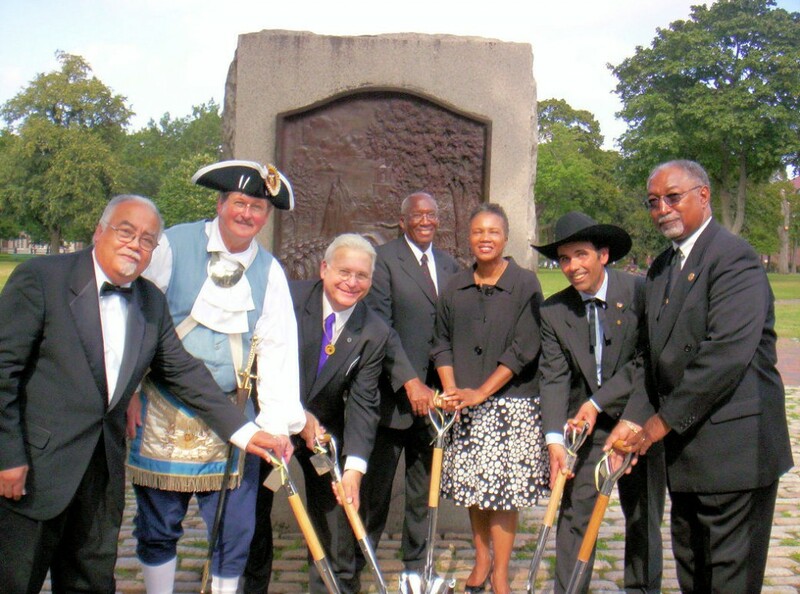 In 1776 a group of African-American Masons in Boston began meeting as a Lodge; they were formally chartered by England in 1784 as African Lodge #459. African Lodge and its descendants developed a separate Grand Lodge system, known as Prince Hall Masonry (after the first Master of African Lodge). Prince Hall Grand Lodges ascribe to the same beliefs and rituals of Freemasonry as do all regular Masonic Lodges throughout the world. Since a petition for membership in Masonry does not ask a petitioner’s race, statistics on ethnic breakdowns are not kept by any Grand Lodge. Collecting such information is considered as inappropriate as collecting information about a Brother’s financial standing. A lodge is not permitted to accept or exclude a candidate on the basis of his race or national origin. To petition for membership, the petitioner must be “a man of legal age, good reputation, and possess a belief in God.” While election to membership in the fraternity is a matter for the local lodge to decide, the qualifications for membership are standard, and all Masons are required to observe them.